Our first topic of 'Paws, Claws and Whiskers' will allow children to explore the world of domestic and big cats. The children will have the opportunity to compare animals within the cat family as well as looking at their habitats within the home and wild. 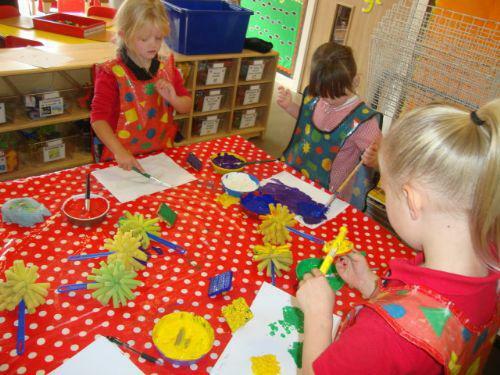 This topic has a Creative Development focus and enables children to develop their artistic skills and ideas using a range of expressive and creative processes. Towards the end of the project children will be able to apply their experiences, knowledge and understanding in a creative way to care for a lost cat. We have been very busy getting to know the teachers and making new friends. We have particularly enjoyed exploring the paint and using stampers to create different effects. 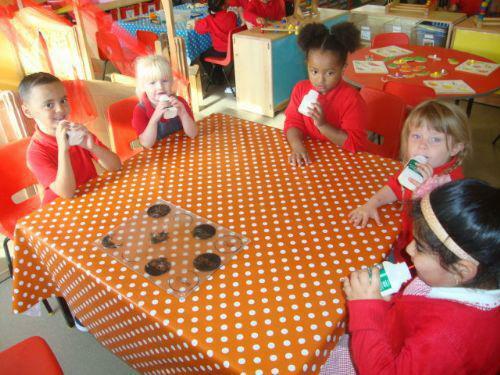 We have been enjoying our milk on the new snack table. We have been trying hard to remember our manners when asking for milk and snack. Remember the 'Munching Monkeys' lunchtime activity has now started again! We have had a wonderful week learning the nursery rhyme, 'Humpty Dumpty.' The children have been getting creative by painting and collaging their very own Humpty Dumpty. We have also been making tracks in the paint, sand and water! 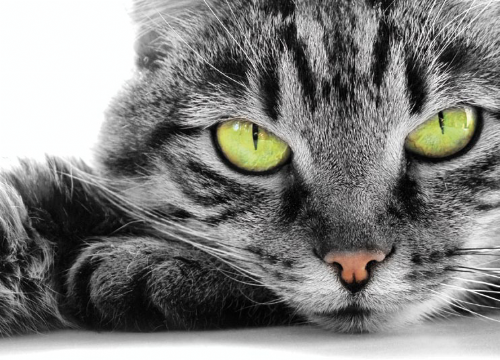 This week we have started learning all about cats. We have found out that lions and tigers are part of the cat family and we have looked at some cat books to find out what they look like. We found out that all cats have whiskers and claws! We have also continued learning about Humpty Dumpty and trying to build a wall for him to sit on! We have been enjoying playing in the water this week, learning about squeezing, twisting, pouring and squirting. We have been continuing to learn about cats and have made some lion faces using all our artistic skills to paint, cut and stick different materials together. We have had some special animal visitors in school this week. 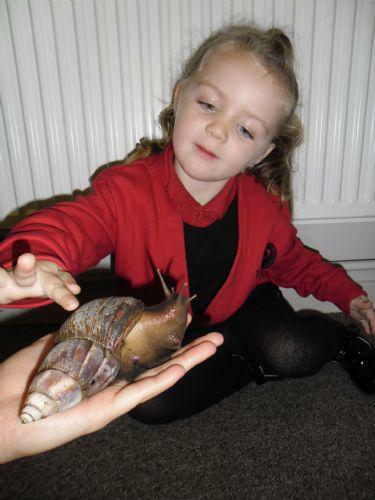 Zoolab came in and introduced the children to Babs the rat, a giant African snail, a millipede, a snake and a tarantula. The children had the opportunity to look at, touch and hold each of the animals whilst finding out lots of facts about them. Look in the folder below to see lots more photos from Zoolab! The children were also introduced to the story of the Rainbow Fish this week and learnt about how important it is to share. The school has been celebrating Harvest this week and so to keep in theme the Nursery children have been learning the song and dance of the Dingle Dangle Scarecrow. They have learnt about how a scarecrow helps the farmer. The children have been creating crows for the Dingle Dangle Scarecrow to frighten away!